It is unbelievable how many varieties of lentils exist and in how many variations the Indian sub continent can prepare these lentils. I guess people had to be innovative as dal or lentils is a part of the staple diet for most people of the sub continent. This humble moong dal is a staple diet in every home. Quick and easy to make and perhaps not too expensive. Ajay and I love to have this dal or curry with hot chappatis. Oh well he gets the hot chappatis and I get warm ones, but not complaining at all. Goes well with rice too. The secret ingredient for this recipe is kokum or cocum or aamsul, biran. It belongs to the mangosteen family. The outer cover of the fruit of gracinia indica is dried. It tastes sour and is a preferred substitute for tamarind in many cuisines of India. It is easily available in most indian grocery stores. It is either black and a bit sticky or brownish reddish in colour. Green grams or moong are considered ‘sweet’ in taste but moong dal somehow is pretty tasteless. So the need to add different spices to make it more palatable. Every household will have its own secret ingredient to add to the humble dal. I prefer adding kokum and curry leaves. 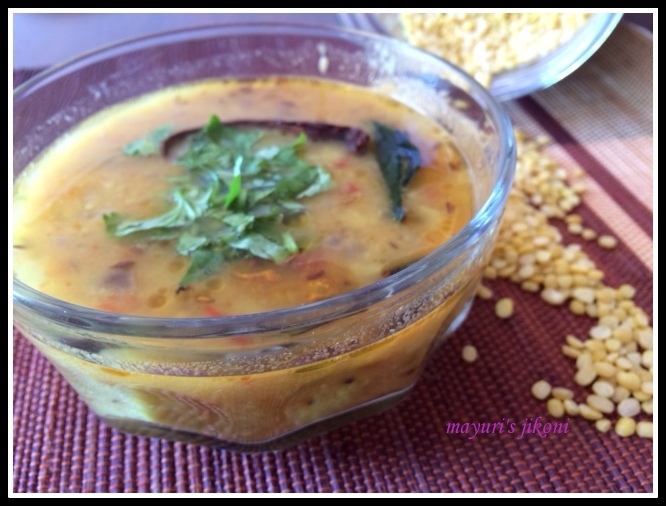 Wash the dal and put it in a pressure cooker with 2 cups of water, 1 tsp cumin seeds and ½ tsp turmeric powder. Cook it for 1 whistles or cook in a pan till the lentils are done. If you cook in a pan, you may need more water. Moong dal cooks very easily. Heat the oil or ghee in a pan over medium heat. When it is hot, add mustard seeds, cumin seeds and kokum and let it sizzle for a few seconds. Add onions and asafoetida and stir fry till it becomes soft. Add ginger and chilli paste. Stir fry for a while. Add chopped tomatoes and cook for 3 to 4 minutes or till it becomes soft. Add the remaining turmeric powder and dhana jiru. Add the cooked lentils, salt and remaining water. Simmer over low heat for 20 to 30 minutes. Stir occasionally. Heat ghee in a small pan for tempering. Add cumin seeds, garlic and a pinch of hing. Stir fry over low heat till the garlic begins to turn pink. Add dry red chillis and curry leaves. Add the chilli powder and pour the mixture into the dal. Cover the pan with a lid so that the aroma of the tempered mixture can infuse into the dal. Garnish the dal with fresh chopped coriander and serve it hot. Can add lemon juice or tamarind paste if you don’t find any kokum. Add more water if the curry becomes too thick. Can use ½ cup tomato puree instead of fresh tomato. All my recipes use fresh homemade puree and not the ready made tomato paste that comes in a tube or can. Adjust the amount of chilli according to your taste.